This blog post is authored by Warren Mercer and Paul Rascagneres and with contributions from Jungsoo An. "North Korean Human Rights" campaign. "Evil New Year 2018" campaign. On January 2nd of 2018, the "Evil New Year 2018" was started. This campaign copies the approach of the 2017 "Evil New Year" campaign. The links between the different campaigns include shared code and compiler artifacts such as PDB (Program DataBase) patterns which were present throughout these campaigns. Based on our analysis, the "Golden Time", both "Evil New Year" and the "North Korean Human Rights" campaigns specifically targeted South Korean users. 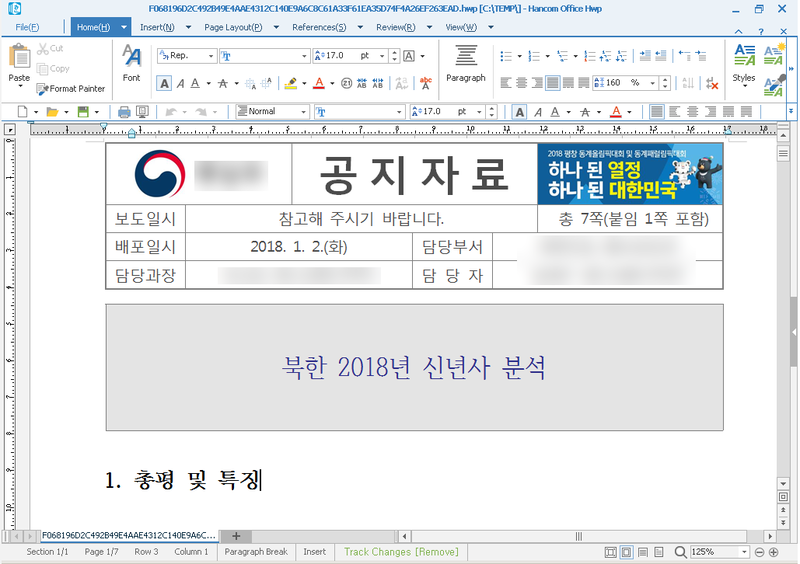 The attackers used spear phishing emails combined with malicious HWP documents created using Hancom Hangul Office Suite. Group 123 has been known to use exploits (such as CVE-2013-0808) or scripting languages harnessing OLE objects. The purpose of the malicious documents was to install and to execute ROKRAT, a remote administration tool (RAT). 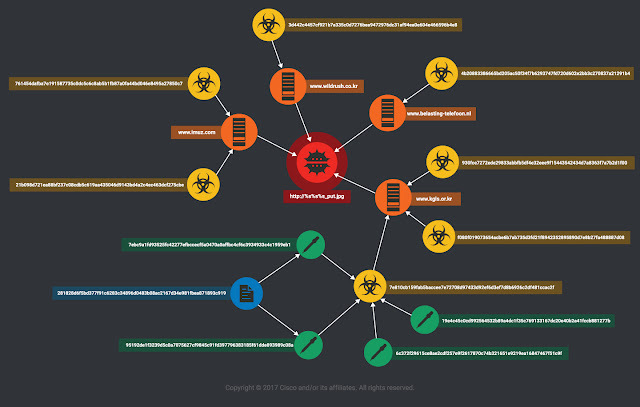 On occasion the attackers directly included the ROKRAT payload in the malicious document and during other campaigns the attackers leveraged multi-stage infection processes: the document only contained a downloader designed to download ROKRAT from a compromised web server. Additionally, the "FreeMilk" campaign targeted several non-Korean financial institutions. In this campaign, the attackers made use of a malicious Microsoft Office document, a deviation from their normal use of Hancom documents. This document exploited a newer vulnerability, CVE-2017-0199. Group 123 used this vulnerability less than one month after its public disclosure. 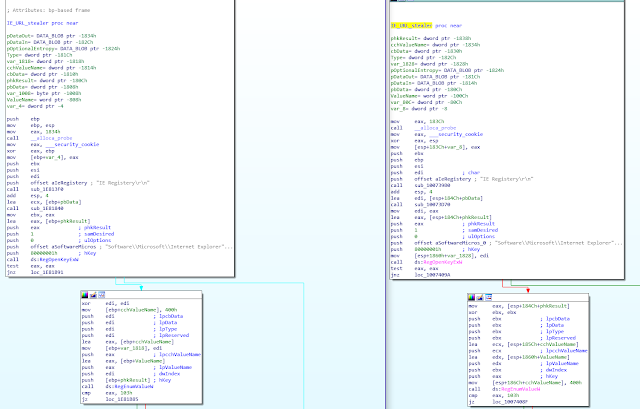 During this campaign, the attackers used 2 different malicious binaries: PoohMilk and Freenki. PoohMilk exists only to launch Freenki. Freenki is used to gather information about the infected system and to download a subsequent stage payload. 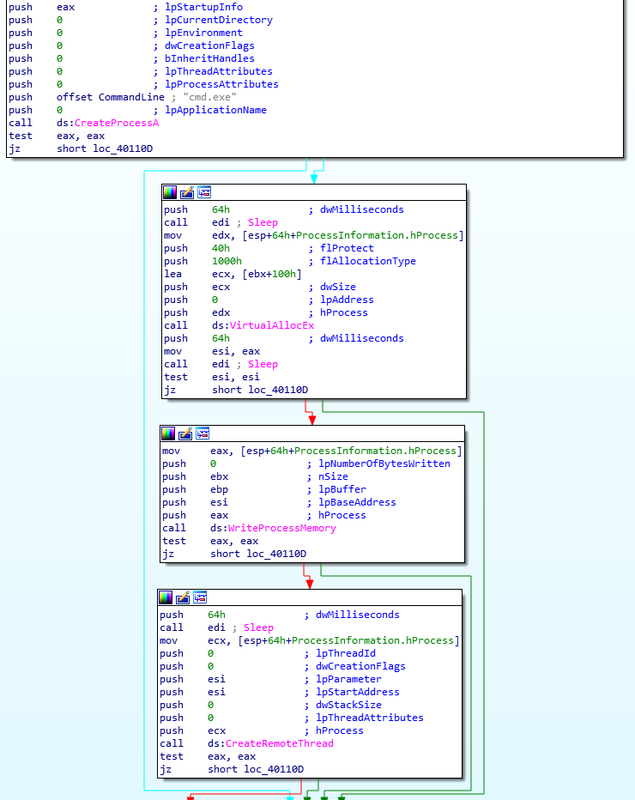 This malware was used in several campaigns in 2016 and has some code overlap with ROKRAT. Finally, we identified a 6th campaign that is also linked to Group 123. We named this 6th campaign "Are You Happy?". In this campaign, the attackers deployed a disk wiper. The purpose of this attack was not only to gain access to the remote infected systems but to also wipe the first sectors of the device. We identified that the wiper is a ROKRAT module. 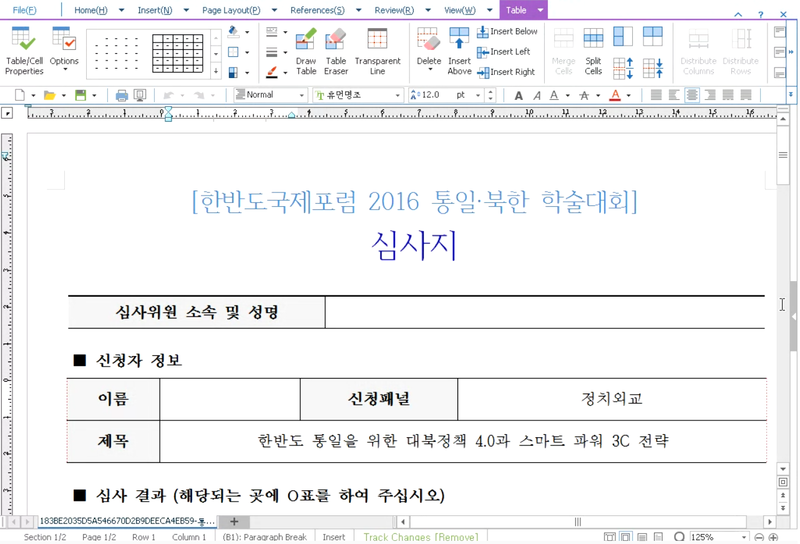 To include exploits (for Hangul and Microsoft Office) in its workflows. To use compromised web servers or legitimate cloud based platforms. To use HTTPS communications to make it harder to perform traffic analysis. To compromise third parties to forge realistic spear phishing campaigns (i.e. Yonsei university in the "Golden Time" campaign). To constantly evolve, the new fileless capability included in 2018 is a proof. As with the majority of Group 123 campaigns, the initial attack vector during this campaign was spear phishing. Talos identified two different kinds of emails. The first email we discovered was the most interesting. In this sample, we observed the attackers praising the user for joining a panel related to the "Korean Reunification and North Korean Conference". The text in the email explained that the recipient should complete the attached document to provide necessary feedback. This appears to be a non-existent conference. The closest match we identified related to any Unification conference was held in January 2017, which was the NYDA Reunification conference. 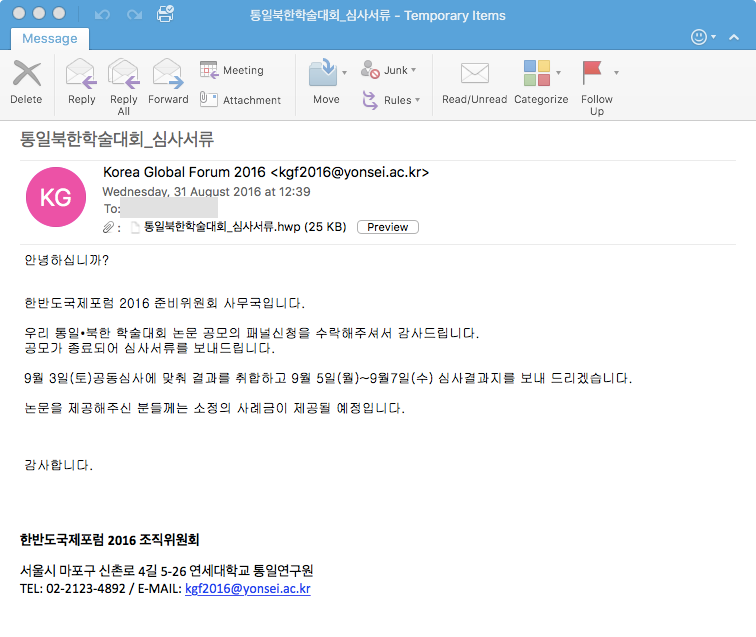 The sender was 'kgf2016@yonsei.ac.kr' which is the contact email of the Korea Global Forum, a separate conference. 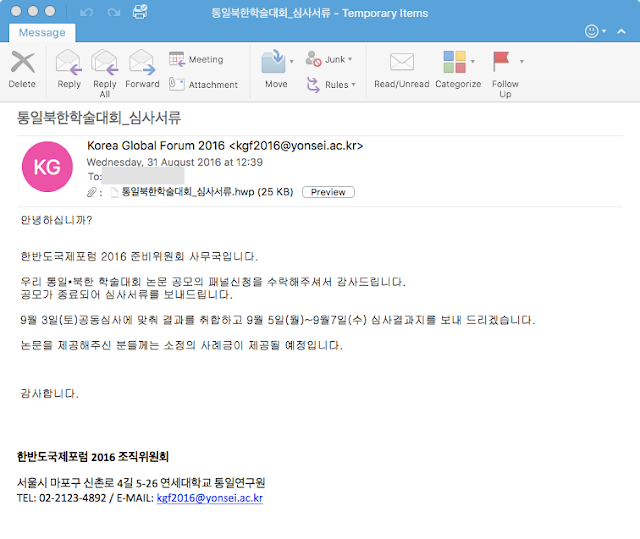 When we analyzed the email headers, we determined that the email was sent from an SMTP server using an IP associated with the Yonsei University network. We believe that the email address was compromised and abused by the attackers to send the email used in this campaign. Much less effort was used to craft the second email Talos analyzed. 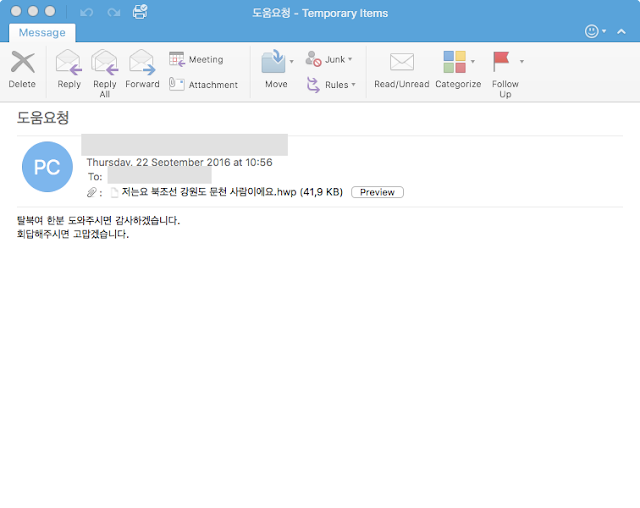 The email was from a free Korean mail service provided by Daum, Hanmail, indicating that there was no attempt to try to appear as if it originated from an official body or person, unlike the previous email described. The subject was simply 'Request Help' while the attachment filename was 'I'm a munchon person in Gangwon-do, North Korea'. We suspect the attacker was trying to generate sympathy by reminding the reader that Munchon and the province it is in, Kangwon, were part of a unified province that included South Korea's Gangwon-do prior to the division of Korea in 1945. 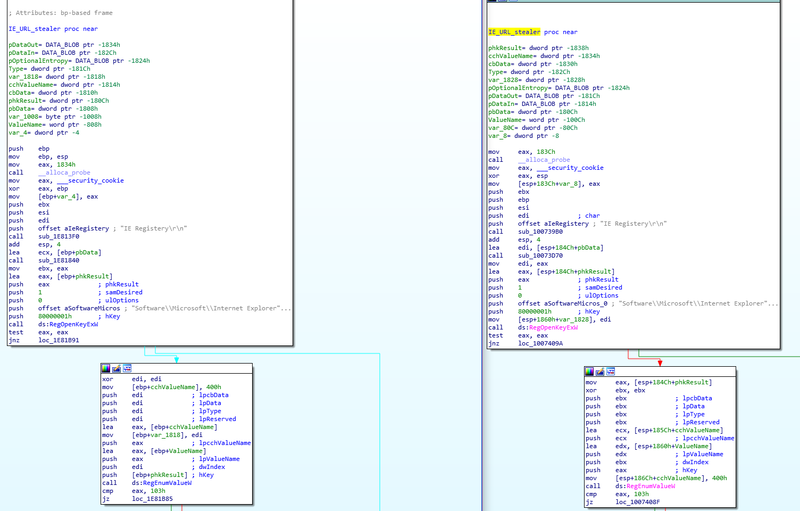 In both cases, the downloaded payload is the ROKRAT malware. In the early part of 2017, Group123 started the "Evil New Year" campaign. In this campaign the actors tried to fool victims by pretending the emails were from the Korean Ministry of Unification and that they offered Korean-specific analysis. This campaign began with a handful of spear phishing emails to South Korean targets and containing malicious attachments. 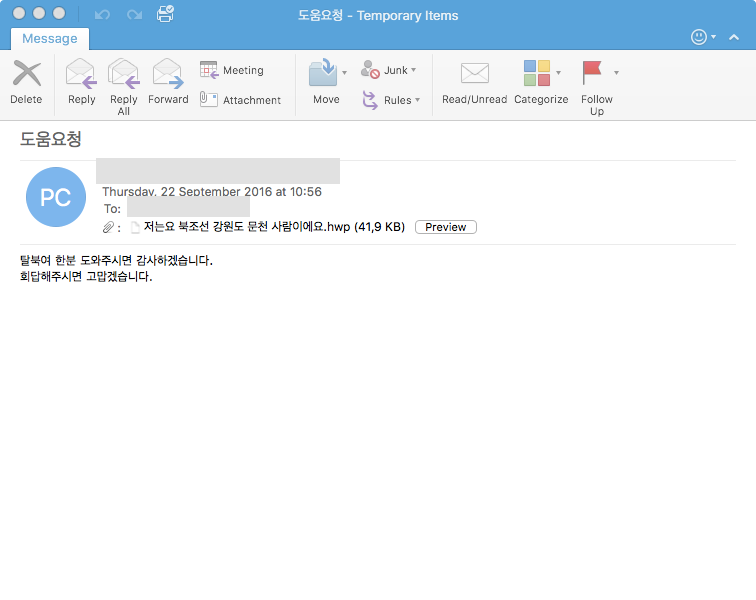 Group123 further attempted to entice victims to open the attachments by using common Hancom Hangul documents. 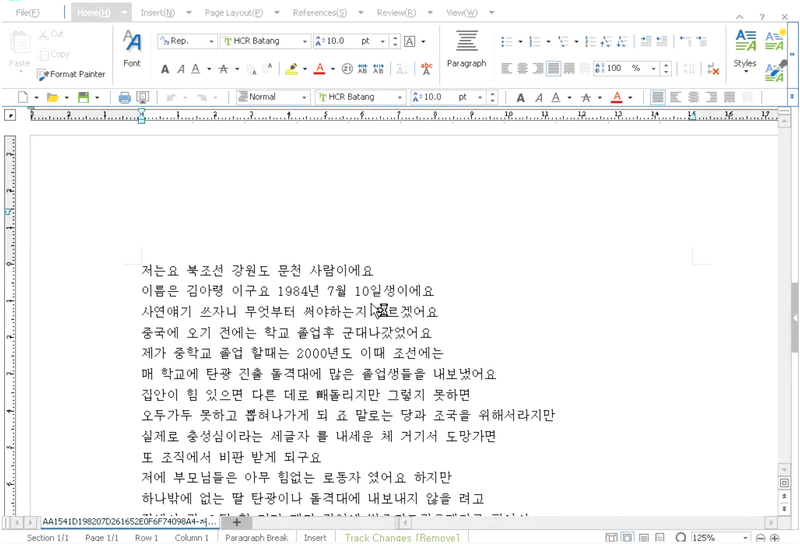 Hancom's Hangul is a popular Office Suite used primarily in the Korean peninsula. The use of Hangul office documents has the advantage of being the norm for the Korean peninsula. If the attacker used Microsoft documents, it may have raised suspicions in the victim. Given the regional file format used there is a chance that some security software suites may not handle them well, and this may have provided an evasion case for the attacker. 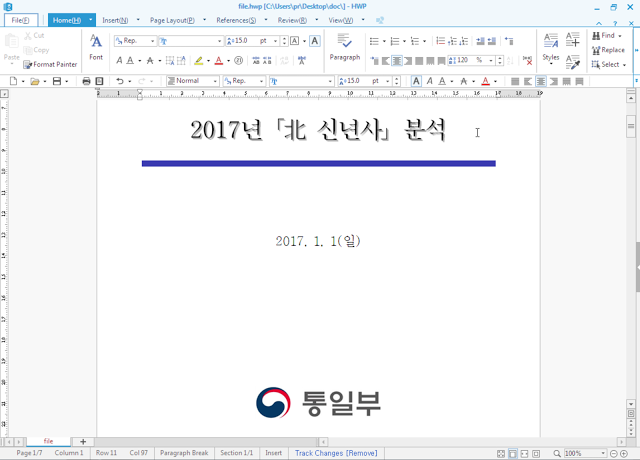 The documents sent to the targets were titled "Analysis of "Northern New Year in 2017" and used the official logo of the Korean Ministry of Unification. This is a simple choice for the actor to make, but it further shows their familiarity with the region. The document claimed to discuss the New Year's activities of North Korea and this would have been something that the victims in South Korea would be very interested in. This would have been particularly true for Government targets, who we believe to be Group123's target of choice. The actor embedded two additional links and the document urged the user to click on these links for more information about New Year's activities in North Korea. The first link was labeled as "Comparison of Major Tasks in '16 & '17" and the second link was identified as "Comparison between '16 & '17". Upon opening these links the user was presented with a further decoy Hangul document. This document was well written and further increases our confidence that we are dealing with a new Korean actor. These documents contained malicious OLE objects used to drop binaries. This time, however, they contained malicious OLE (Object Link Embedded) objects. Initial analysis confirmed two similarly sized OLE object files within this document which appeared to be the same from an execution point of view. 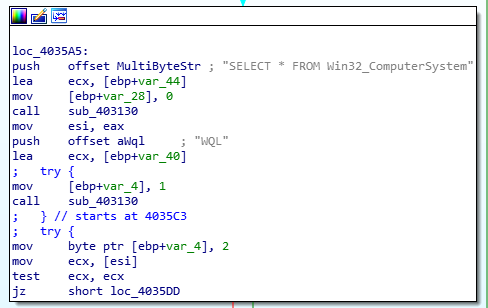 The second stage of the dropped binaries was used to execute wscript.exe while injecting shellcode into this process. The shellcode is embedded within the resource 'BIN' and is used to unpack another PE32 binary and use wscript.exe to execute it. To do this, Group123 uses a well-known technique that harnesses VirtualAllocEx(), WriteProcessMemory() and CreateRemoteThread() Windows API calls. Group123 utilized this method to ensure their victim was (a) someone they wanted to target further and (b) someone they could infect further based on the information obtained from the reconnaissance phase. Korean Government Legal Services (KGLS) is a legitimate Korean government body that manages Korean government legal affairs. By compromising the KGLS, the attacker gained a trusted platform from which to execute an attack. The initial network connection is to 'index.php'. This connection transmits the information gathered during the reconnaissance phase. The attacker uses this information to then determine the specific filename (based on the random ID) to serve to the infected victim. In our case this was 02BC6B26 - this meant a file "02BC6B26_put.jpg" was created for us on the attackers C2. This file is then dropped and renamed 'officepatch.exe' on the victim's machine. Because the attacker was careful about who they attacked, we were unable to obtain this file during our analysis. Contrary to the previous campaign, the attackers separated the reconnaissance phase from the main ROKRAT payload. This trick was likely used to avoid detection. 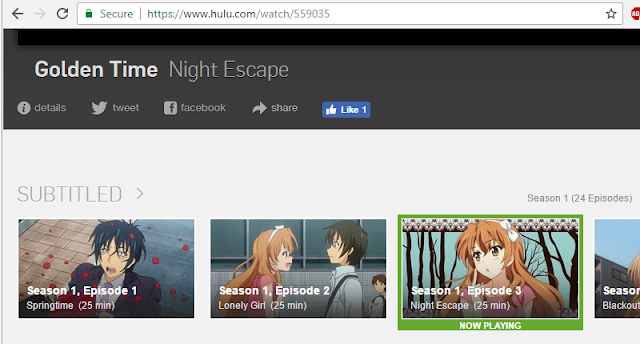 This is an interesting adaptation in Group 123's behavior. As you can see, it perfectly matches the ROKRAT PDB. This wiper is a ROKRAT module named ERSP.enc. We assume that ERSP means ERaSePartition. This module can be downloaded and executed on demand by Group 123. This sample is interesting considering the attack in December 2014 against a Korean power plant where the message that was displayed by the wiper was "Who Am I?". This campaign targeted non-Korean financial institutions, but unlike the other campaigns, this one does not use HWP documents. It instead uses Office documents. This change is because Group 123 did not target South Korea during this campaign and Microsoft Office is standard in the rest of the world. Appach01.jpg (renamed: Windows-KB275122-x86.exe) is a Freenki sample. Appach01.jpg (renamed: Windows-KB271854-x86.exe) is a PoohMilk sample. Create persistence to execute the Freenki sample at the next reboot. Check specific files on the infected machine. The registry location where persistence is achieved is: HKCU\Software\Microsoft\Windows\CurrentVersion\Run\Windows Update. At the next reboot, the malware will be executed. The second action is to check if the file "wsatra.tmp" exists in the temporary directory of the current user. If this file exists, the content is read in order to obtain a path to find a second file with the LNK (link) extension. 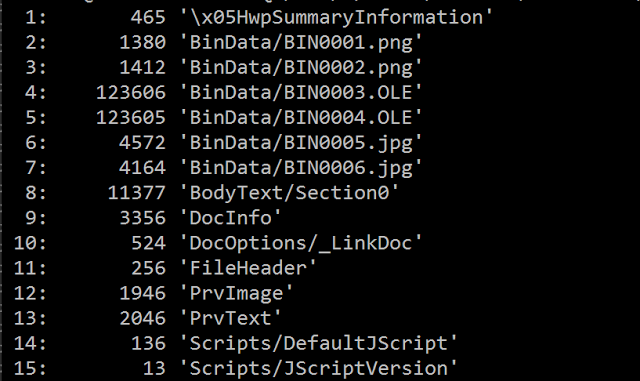 The LNK file is finally used to identify a third file: a ZIP file. The file will be inflated in order to retrieve a RTF document, this document will be displayed to the infected user by executing Wordpad. The purpose of Freenki is to collect information on the infected system and to download a third executable. "Help": the value configured by PoohMilk. In this context the main function is executed. 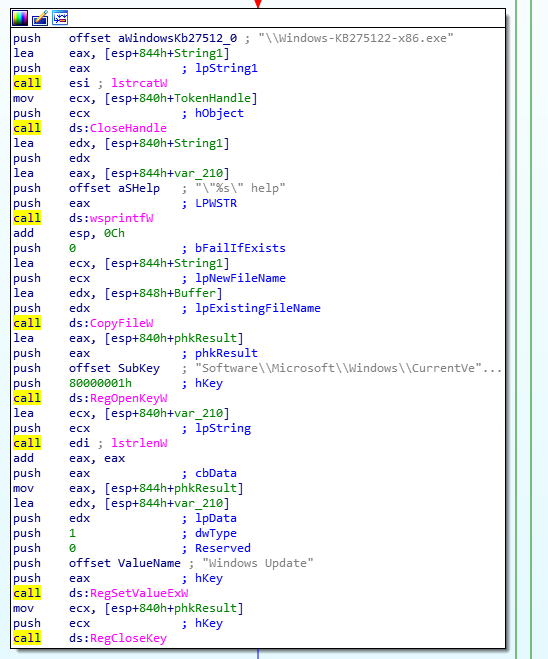 "Console": with the argument, a persistence is configured and the malware will be executed at the next reboot ( HKCU\Software\Microsoft\Windows\CurrentVersion\Run\runsample ). "Sample": with this argument, the malware executes the console command followed by the help command. The downloaded third payload is obfuscated using the same technique. The file is a fake image starting with "PNGF". In November 2017, Talos observed the latest Group123 campaign of the year, which included a new version of ROKRAT being used in the latest wave of attacks. Group 123 again used one of their main calling cards, the malicious HWP document. 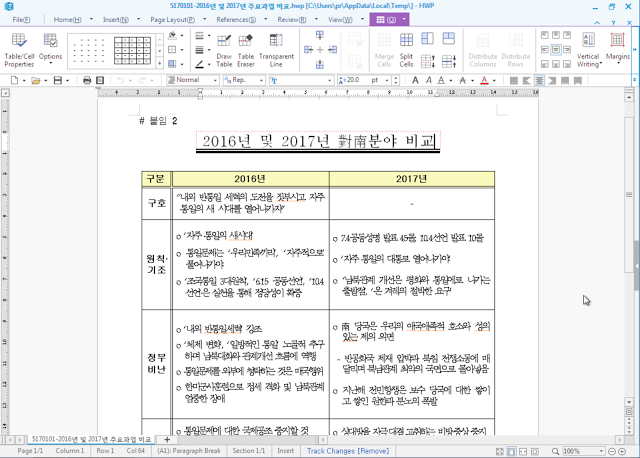 This time, Group 123 used a document containing information in relation to a meeting held on 1st November in Seoul, South Korea. This document was alleged to have been written by a legal representative claiming to be representing the "Citizens' Alliance For North Korean Human Rights And Reunification Of Korean Peninsula". Group 123 once again uses information related to the Korean unification and now are claiming to highlight concerns related to human rights issues. The document brought Talos a new gift - a new version of ROKRAT. 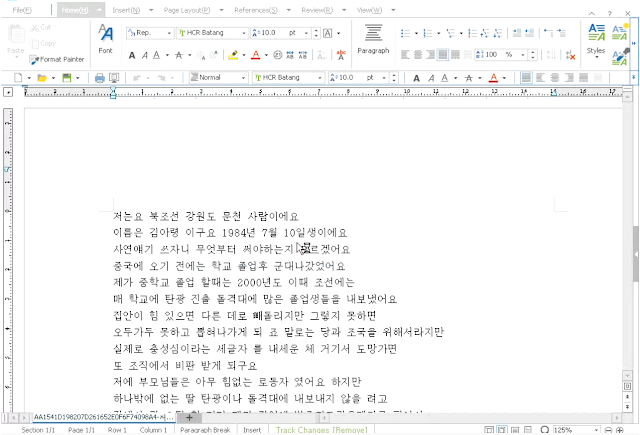 Following on with the normal Group 123 activity the document was written in perfect Korean text and dialect again suggesting the origin of this group is from the Korean peninsula. Further analysis of the document text allowed us to understand the context. The document mentions 'Community of North Korean human rights and unification' with the lawyer claiming to be part of the "Citizen's Alliance for North Korean Human Rights and North-South unification". The main purpose of this document was an attempt to arrange a meeting to discuss items related to "North Korean Human Rights Act" and "Enactment of a Law" which was passed in 2016 in South Korea. We believe that the document was attempting to target stakeholders within the '올인통' community in an attempt to entice them to join the discussion in an attempt to work on additional ideas related to these activities. The meeting was due to take place on November 1, 2017 and this document was trying to garner additional interest prior to the meeting. This script is executed and is used to decode a static base64 string within the strEncode variable. Using base64 encoding the decoded binary is stored as HncModuleUpdate.exe and is then executed. This is the ROKRAT dropper. Talos suspect the filename may have been selected to make it appear within running processes as a potential Hancom updater. The dropper is used to extract a new resource named SBS. This specific resource contains malicious shellcode used by the malware. 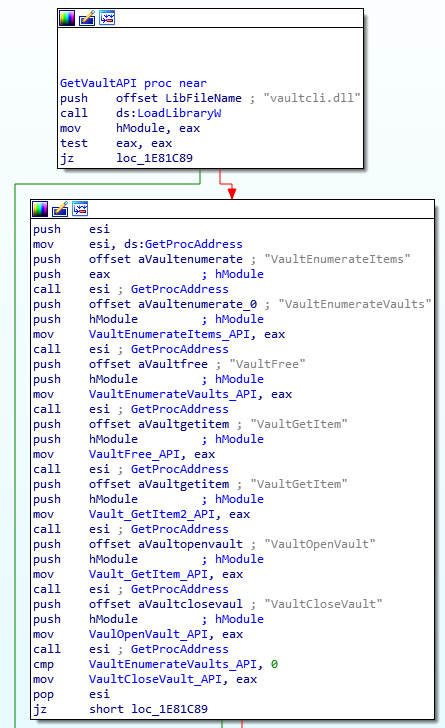 Additionally we see a cmd.exe process launched and used for process injection using the VirtualAlloc(), WriteProcessMemory() and CreateRemoteThread() Windows APIs, as with the first finding of ROKRAT they continue to use similar Windows APIs. 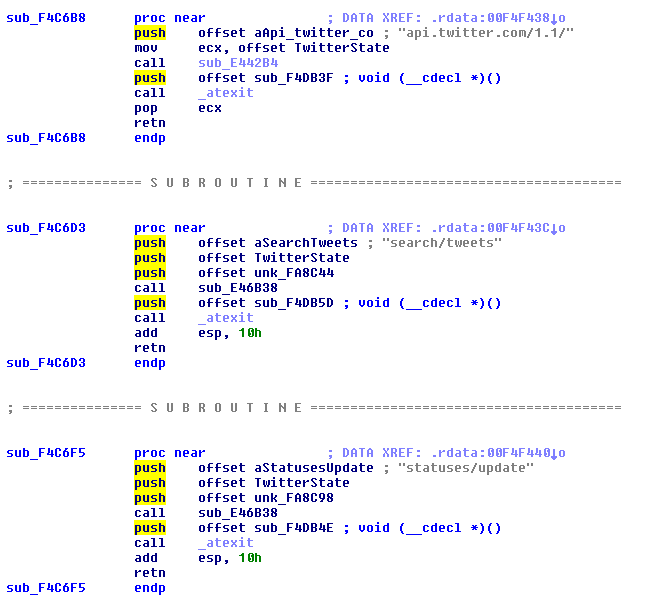 The following graph view from IDA shows these steps. These execution steps allow the launch of the new ROKRAT variant by decoding the PE binary and injecting into the cmd.exe process. One of Group 123 oddities in this campaign was to drop the following picture as a decoy image to the user. 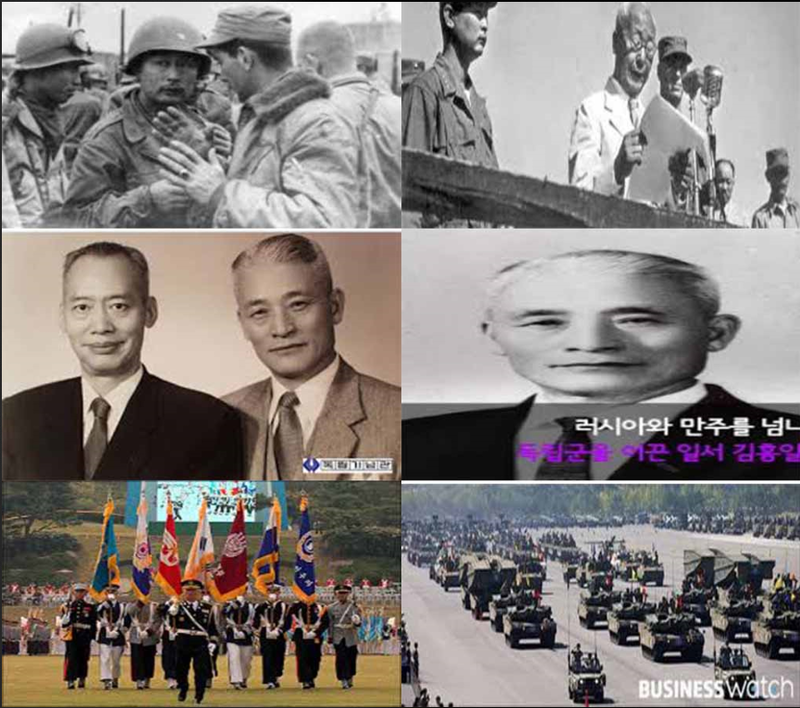 This image shows various publicly available images which look to be related to the Korean 'Independence Movement' and appear to be related to the Korean war. We began performing further in-depth analysis on this new version of ROKRAT and this is where we started to notice some similarities with Group 123s "Evil New Years" campaign. The similitudes are discussed later in this paper. This ROKRAT variant contained anti-sandbox techniques. This is performed by checking if the following libraries are loaded on the victim machine. 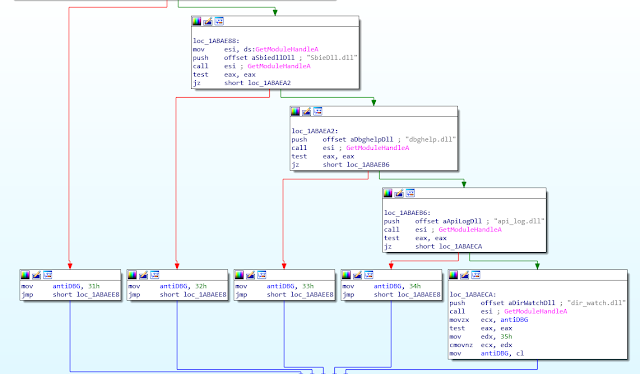 We were able to uncover some other techniques used by this variant of ROKRAT to make analysis difficult, Group 123 used an anti-debugging technique related to NOP (No Operation). nop dword ptr [eax+eax+00h] is a 5 byte NOP. But this opcode is not correctly supported by some debugging tools, Immunity Debugger for example, will replace the assembly by "???" in red making it difficult to attempt to debug. 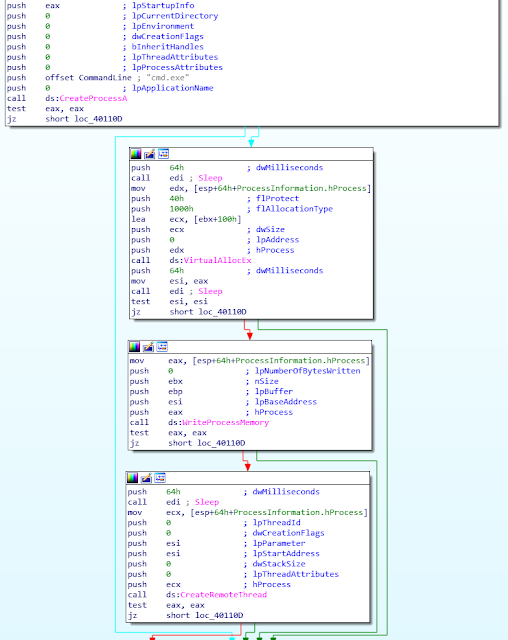 This version of ROKRAT came with a Browser Stealer mechanism which was similar, with a few modifications, to that used in the FreeMilk campaign using Freenki malware in 2016. Group 123 continued their use of Cloud platforms with this campaign, this time leveraging pCloud, Dropbox, Box and Yandex. This decoy document is an analysis of the 2018 New Year speech made by the leader of North Korea. The approach is exactly the same as what was seen in 2017 using a new decoy document. This document was alleged to have been written by the Ministry of Reunification as demonstrated by the logo in the top left. The fake image usage is a common pattern for this group. 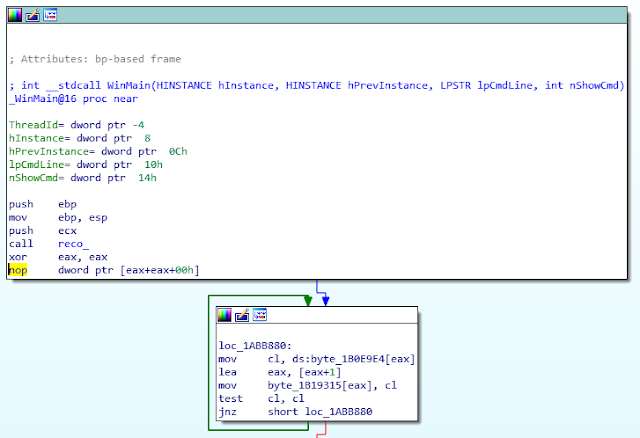 This image contains shellcode used to decode the embedded final payload: ROKRAT. This ROKRAT variant is loaded from memory. It's a fileless version of ROKRAT. This behavior shows that Group 123 is constantly evolving to avoid detection. As usual, the ROKRAT sample uses cloud providers to communicate with the operator, this time leveraging Yandex, pCloud, Dropbox and Box. 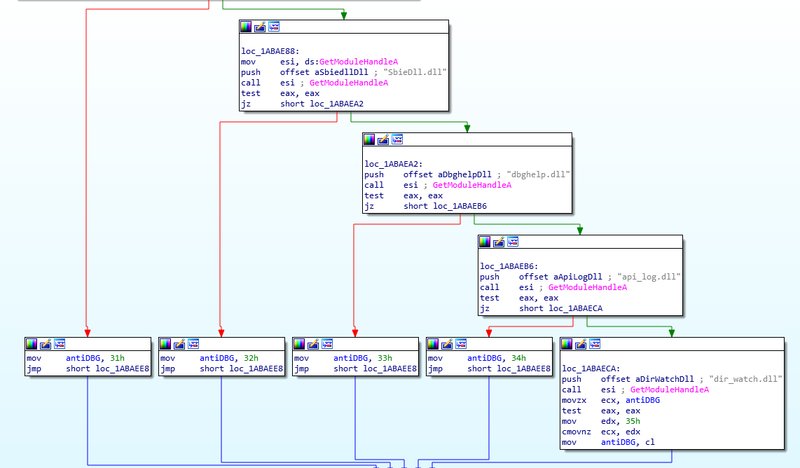 Talos has identified that Group 123 shares code between different malware. Several features are shared in the samples mentioned in this article; however we will cover only two in this article: the reconnaissance phase and the browsers stealer. The ROKRAT samples used during the two "Evil New Year" and the "North Korean Human Rights" campaigns contained a reconnaissance phase. In the "Evil New Year" campaign the payload was split into two parts, the first part contained the reconnaissance code. In the other campaign the reconnaissance phase was directly included in the main payload. This code is the same. The string format - with the () - and the considering types are exactly the same as those used in the ROKRAT samples. It's interesting to note that this reconnaissance phase was not included in the ROKRAT variant used during the "Golden Time" campaign. For the first time, the ROKRAT sample used during the "North Korean Human Rights" contained a browser credentials stealer. The code used to perform this task in the same that found within in a Freenki sample deployed in 2016. We can clearly identify a pattern in the PDB naming convention of all the binaries mentioned in this article. South Korea is becoming an important target for malicious actors and the techniques used are becoming specific to the region (for example: use of native language to try and ensure the targets feel that the information, document or email being sent to them has added legitimacy). In a specific campaign, this actor took time to compromise multiple legitimate Korean platforms including Yonsei and the KGLS in order to forge the spear phishing campaign or to host the command and control. This approach is not common with less advanced actors and demonstrates a high level of maturity and knowledge of the Korean region. However Group 123's activities are not limited to South Korea. For international targets, they are able to switch to a more standard attack vector such as using Microsoft Office documents as opposed to the specific HWP documents used when targeting victims located in Korea. Group 123 does not hesitate to use public exploits and scripting languages to drop and execute malicious payloads. We can notice that this group uses compromised legitimate websites (mainly Wordpress) and cloud platforms to communicate with the infected systems. This approach makes it difficult to detect communications through analysis of these network flows. Even if the arsenal of this actor is diverse, we have identified some patterns, copy-paste code from various public repositories and similarities between the different piece of code. In addition to the Remote Administration Tools, we identified a wiper. We conclude that this group was involved in a campaign of intelligence gathering and finally attempted destruction. With our current knowledge of this actor, we predict that they will not disappear anytime soon and will continue to be active during the coming years. Group 123 is constantly evolving as the new fileless capability that was added to ROKRAT demonstrates. 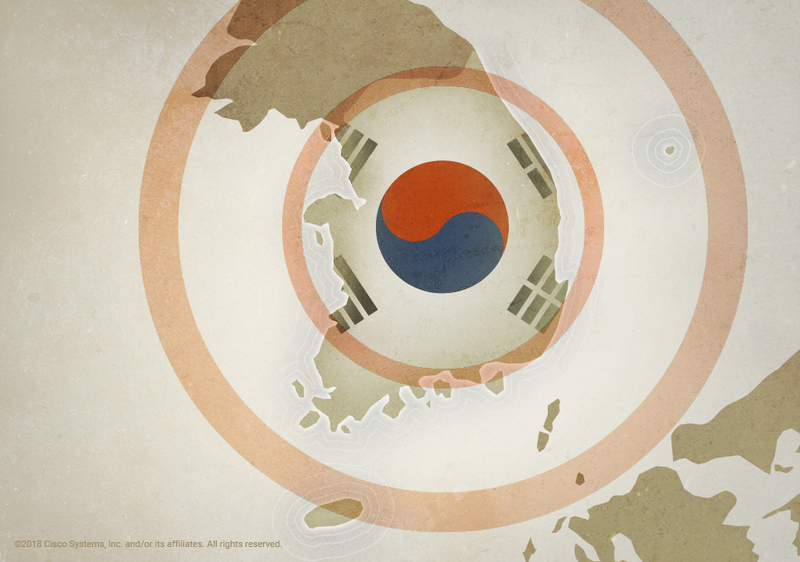 We also believe their target profile may change but for now it will mostly focus on Korean peninsula targets, however, as explained their capabilities will likely continue to evolve over time as they further refine their TTPs.